So what to write about these steady captains on the proud ship "HMS Gay Disco Mayhem"? 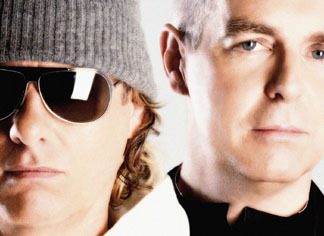 I was rather old before I sort of got the idea behind the Pet Shop Boys. Of course Go West is an instant classic, but for some reason I never really got their over-the-top concept of pop. I'm not going to give a precise date, since I don't know it myself. It probably boils down to the fact that when good pop commands you to dance, something eventually dawns on you. The 'Boys have just released their new Trevor Horn produced Fundamental, a powerful dosis disco for the mainstream radioes. For some reason they have become really cool again, don't know why, but they've got the cool guys remixing them and they have done a remix of Madonna. You can't really ask for more right? I bet whatever would want more, they would have it! I strongly urge you to get their new album with the limited bonus disc which has some really banging remixes! Checkout Wikipedia for a really thorough biography by the way. First one is Distortion Disco favorite Richard X, starting of with synth strings you are transported into the role of the princess at the gay prince's palace. Suddenly there is bass! You start into the best disco moves ever witnessed by man! Richard X manages to turn all the right dials to make this song even more Pet Shop Boys than the actual boys themselves. Second song is by the Danish sheriff of electronica Trentemøller! The Sodom and Gomorra Show gets the minimal treatment, but then mutates into an electro punk monster. Enjoy that bass line! From there we get more strings, more pop and a breakdown! Distortion Disco loves a good breakdown, thus this song scores high.